Feel the familial warmth at Ban Na Chueak, a rural Isan community in Sakon Nakhon where the locals live in harmony with nature and have a close bond with the buffaloes. Learn how farmers in the Northeastern region live their everyday life... and even how buffalo manure can be used to dye clothes! 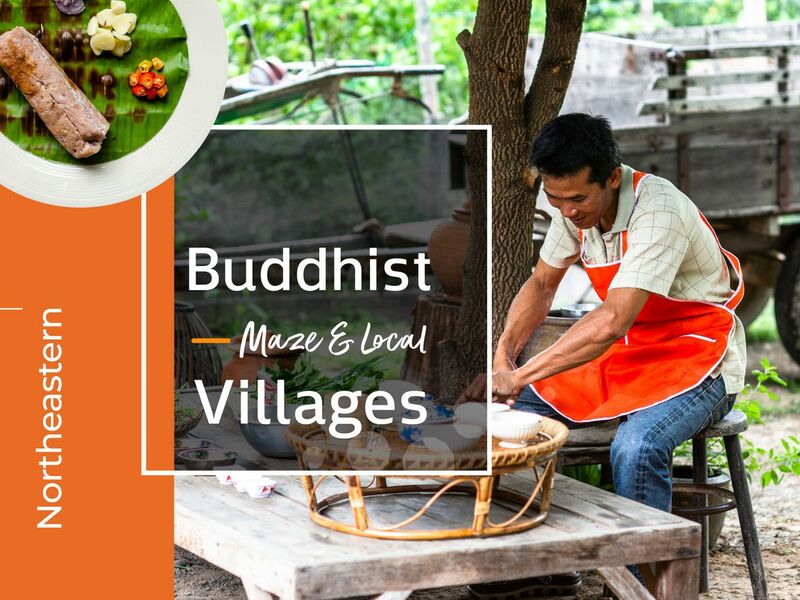 We'll also cook up Isan meal for you with locally sourced ingredients. Arrive at Ban Na Chueak Community. Meet the locals, who will greet you with sincere smiles on their faces and become your family here. Then get to know the community better from the local guide who will share with you their stories. Let's have fun by joining the local activities. You'll learn why and how the locals' way of life is intertwined with buffaloes. First, we'll hop onto an E-Taen (farm tractor) and enjoy the ride along the local dam. Keep your eyes open for the beauty of Buffalo Island while listening to the stories about our friendship with buffaloes. Then we'll bathe the buffaloes and collect their manure for our afternoon workshop. After that, we'll have authentic local lunch. Get back onto the E-Taen vehicle and travel back to the village for more local activities. After arriving at the village, let's see how we dye our clothes with buffalo manure. You can also design your own t-shirt and take it home. Lastly, we'll see the local products. Leave the community. Hope you had a lot of fun during our trip. We can take you back to Sakon Nakhon Airport. We had a good insight into the village life around Sakon Nahkon, learning about how they make their offering, seeing a local farm, as well as indigo dyeing!